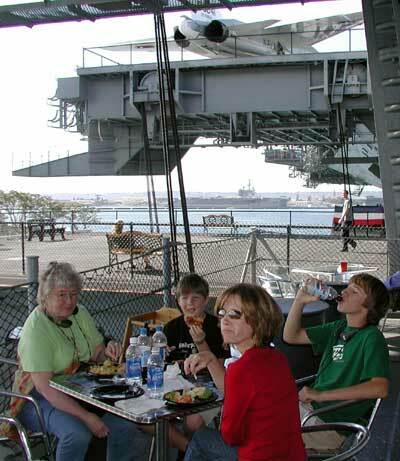 The aircraft carrier Midway, launched in 1946 and decommissioned in 1991, has taken up permanent residence on the Embarcadero downtown. 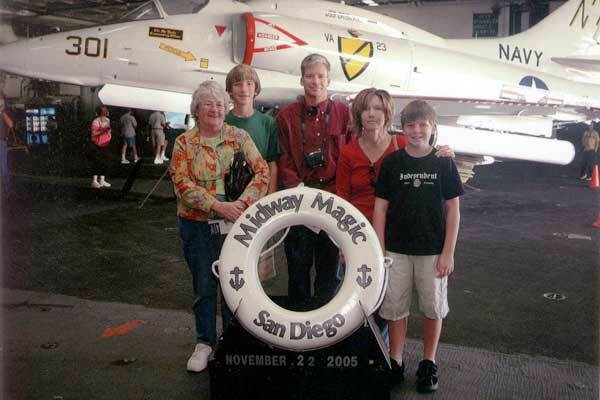 Since opening to the public as a museum in June 2004, it has proven a popular addition to San Diego's tourist destinations. The Sherwoods attempted to visit last year, but were turned back by the crowds. (Okay, so it was the day after Thanksgiving and we should have known better.) 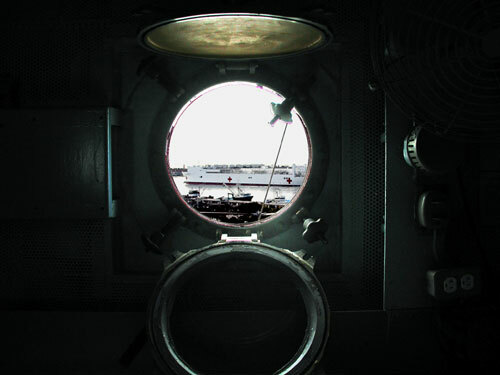 For further information, visit the museum's web site or see what wikipedia has to say about the Midway. We went from picking up Nana at the airport straight to the Midway, arriving within the first hour of opening and beating the crowds. 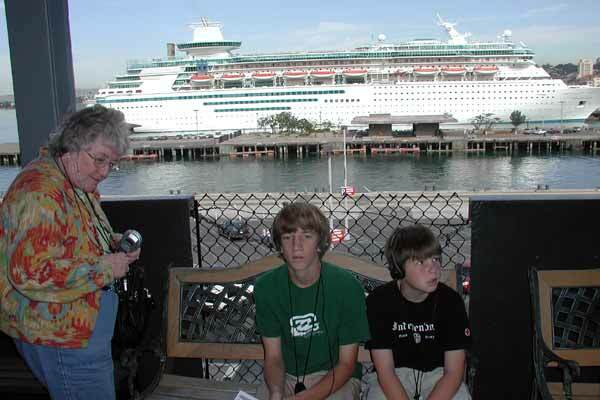 Brad and Doug are not being rude and listening to Walkmans; those headphones attach to the audio set for the guided walking tour. Waiting for our group to reach critical mass to take a tour of the conning tower. Although not a good picture of anyone, it does display the proximity of the Midway on the Navy pier to the cruise ship terminal. This is where the boys were suddenly excited about cruise ships and said they thought it would be fun to vacation on one. 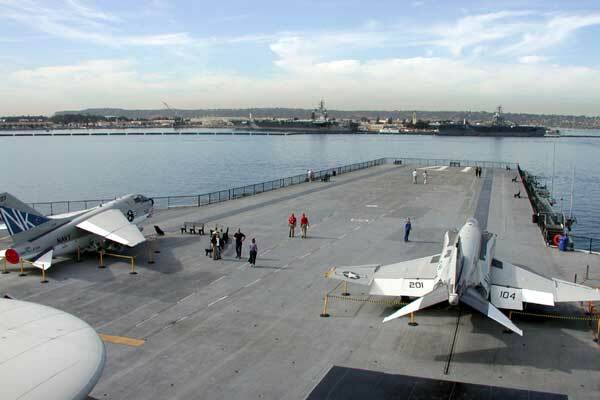 The aft of the Midway points to downtown San Diego. 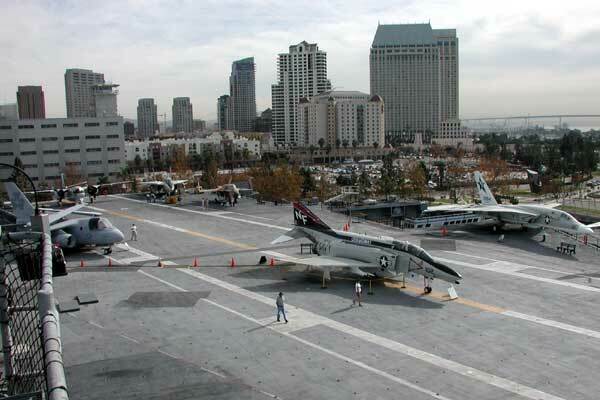 Aside from the aircraft carrier as museum itself, a remarkable collection of Navy and Marine jets and helicopters on the flight deck create a museum within a museum..
(CV-41) points across the bay to the aircraft carriers Nimitz (CVN-68) and Ronald Reagan (CVN-76), currently stationed at North Island. That's Point Loma on the horizon beyond the Coronado Peninsula (i.e. North Island). 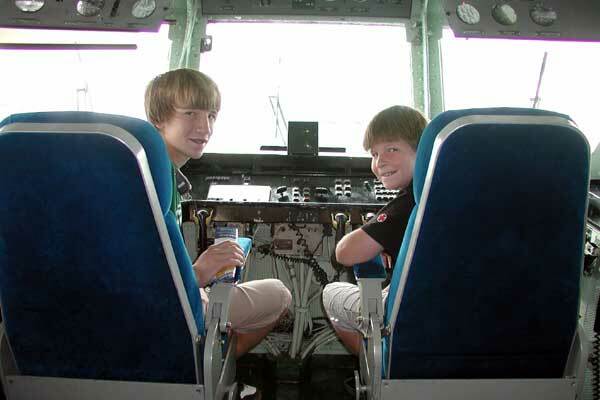 While in the conning tower, each boy got to try out the chairs for size. 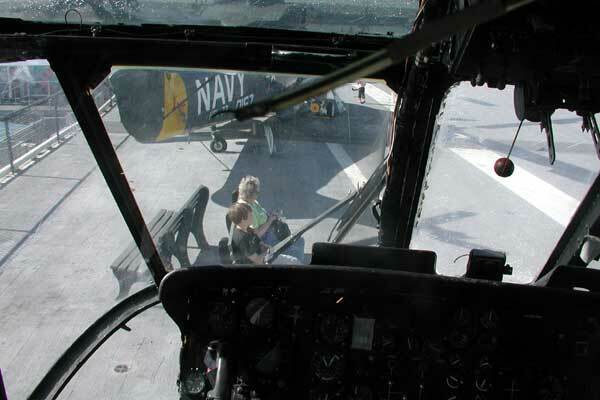 On the bridge, they sat in the captain's chair and admiral's chair. Here, in Air Control, they are in the Air Boss and Jr Air Boss chairs, monitoring the deployment of the airplanes. 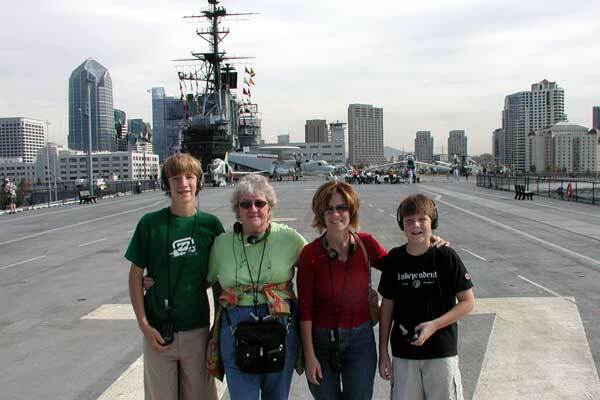 While we were on board what should steam by but the USS Mercy, the West Coast hospital ship stationed in San Diego. All arrows point to Brad. Doug and Nana take a break. 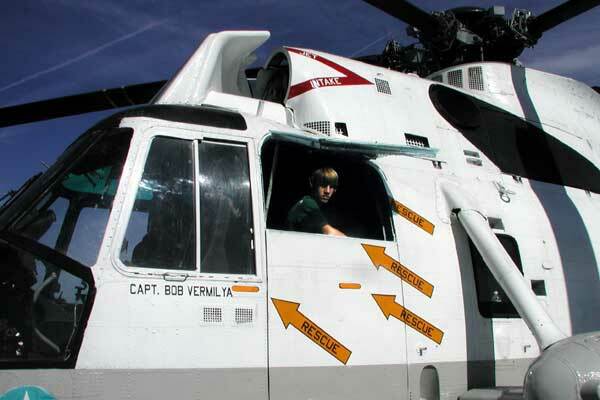 We had lunch on board, the one less than stellar experience during an otherwise delightful day. Still, the view was pretty good when we finally did get our food. I'm sure they were more efficient when they were serving 4000 sailors. 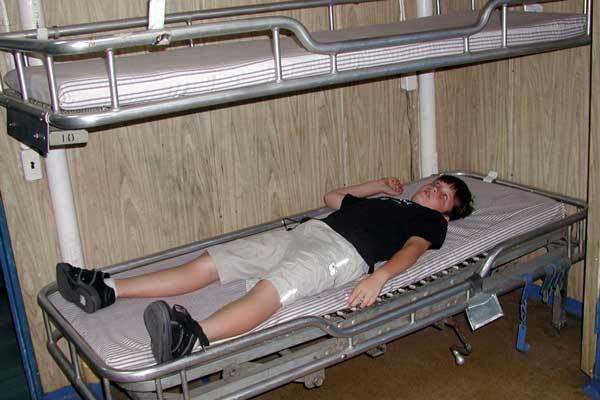 After the flight deck and the hanger deck, we also toured crews quarters, the kitchens and mess halls, and other compartments on board. Here is Doug hamming it up in sick bay. 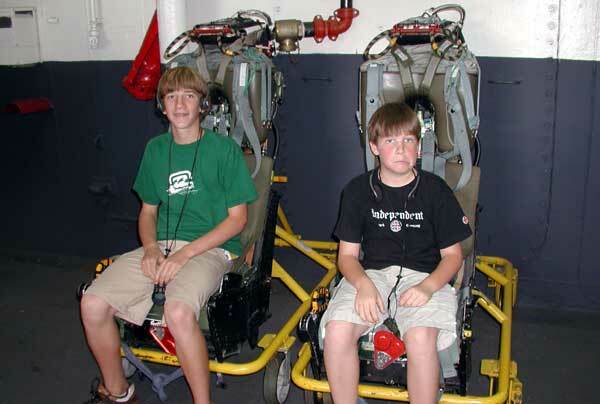 Doug strikes a slightly more worried expression than Brad as they pose in ejection seats. 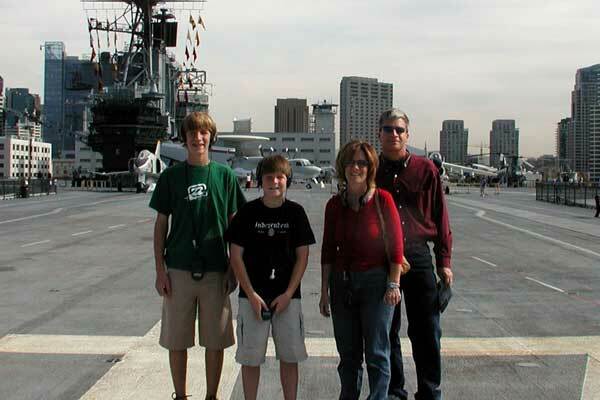 The Sherwoods are on the flight deck.